Last week my company took all the developers to a team-building event at TBC Indoor Kart Racing. About fifty of us descended onto the TBC location for lunch, racing and beer. The beer came after the racing of course. The organizers got everyone into four-person teams for a two-hour race that had complicated rules about safety, pit-stops for driver changes, and track etiquette. The idea was to get everyone to drive at least a couple of times so there were a minimum number of pit-stops required. Of course there were also rules about bumping and running people into walls and such but pretty much it was a race against time. These karts go fast – like 30km or more – and you are basically sitting low with your rear end scraping the ground, a gas engine right behind your seat and a full tank of gas between your legs. You get to wear a helmut and a seatbelt for safety. I’ve done this same thing exactly once before. When I moved to Brussels (for Creo) a number of years ago we also (coincidentally) went to a kart racing track. So I had some experience to bring to the team. It was clear from the introduction that some of my co-workers were far more experienced, but I noticed none of those guys were on my team. Instead we had Tom who has never driven a car before (he has always lived in cities, never had a need to learn, and is from the UK where getting a driving license is not simple nor nearly automatic like it is in Canada and the United States). Everyone was a good sport though and we all wanted to have fun and do well in the race. After two hours it was clear that our team was the best team on the track. We led the next closest team by four laps and some teams by up to seven or eight laps. We didn’t have the fastest driver (track record for the day went to Luke on a different team with 32.9 seconds for one lap, I had the second spot at 33.5 seconds). But we were very consistent (our average lap time was below 39 seconds over the 180+ laps including pit-stops), we didn’t take penalties for rough driving behavior (which cost time) and we were very efficient in changing drivers. Driving these karts is very intense and also very strenuous. The track has lots of tight turns and zig-zags that make you turn the wheel very hard. I must have sweated away several pounds! Even the next day I was feeling the pain in my shoulders and upper arms. But it was a lot of fun and the next day at work was filled with everyone reliving every moment of their moments of glory (or defeat) at the track. I’d highly recommend this sort of event, its not really expensive and the folks at TBC were fantastic. What a great day! The Hubble Space Telescope is sixteen years old and this picture was released to commemerate the event. 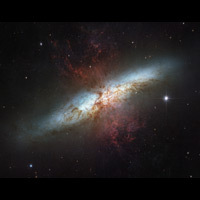 It’s a picture of the galaxy Messier 82. Quoting the website: This mosaic image is the sharpest wide-angle view ever obtained of M82. The galaxy is remarkable for its bright blue disk, webs of shredded clouds, and fiery-looking plumes of glowing hydrogen blasting out of its central regions. Throughout the galaxy’s center, young stars are being born 10 times faster than they are inside our entire Milky Way Galaxy. The resulting huge concentration of young stars carved into the gas and dust at the galaxy’s center. The fierce galactic superwind generated from these stars compresses enough gas to make millions of more stars. The light for this photo took 12 million years to reach Earth so you and I could see it (with a little help from science and engineering). Beautiful! The Coach Is Gone, Who Is Next? It’s happened. Marc Crawford is now the former head coach of the Canucks. Not really surprising. I don’t know if he is really to blame for the mess of this last season (especially since Christmas) but at the end of the day, the coach is the guy who is supposed to get the players to play. He couldn’t get the job done so he is gone. Now the speculation begins about the next coach. I hope its not Pat Quinn. Comments Off on The Coach Is Gone, Who Is Next? I’ve just finished my second and third printed circuit board designs and sent them off for production. The Spark Fun guys have a really cheap deal for hobbyists as long as you (1) aren’t in a huge hurry and (2) are willing to accept back what you send them. User beware, you have to proof you designs carefully as they aren’t going to do it for you. Which is why its cheap. My first board was made for my small six-legged walking robot built by following the mechanical construction described in Karl Williams’ Insectronic book. In addition to the mechanics the book shows you how to make a circuit board using a PIC controller but I wanted to use an Atmel AVR. Plus I added an ultrasonic sensor with a pivoting head which required more pins than what the original design could support. Hence I made my own. It’s a very simple circuit (before laying out the board I built the whole thing on a breadboard in about 30 minutes). It uses an Atmel processor, a crystal oscillator, a bunch of headers and an LED or two. As I said, it’s simple. I really should find some time to take pictures + movies and post them, its a cool little robot. This time I’m using surface mount packages for most everything on both boards. And these boards are more complicated. In addition to the Atmel processor, both are using a Microchip 2515 CAN controller + a transceiver. The first one is using a chip from FTDI that allows the processor to be accessible from USB. It’s basically going to be a bridge between my desktop or laptop and a CAN network. The second board doesn’t use the USB interface but instead plugs into a nifty little GPS module; this module requires a voltage level shifter to translate to the 2.85v used for serial communications rather than the 5v used by everything else. The idea is to create a board that reads GPS data and writes it back to the CAN network. The last time I used the the Spark Fun service it worked out very well but I noticed the layout was shifted on the actual board a small amount from what I expected it to be. Fortunately I was very conservative with my traces so the board still works even if its not “perfect”. I used Eagle CAD again for these latest designs and carefully marked out the board size, thinking I must have made an error last time. But the Gerber files that got saved were offset again (and both boards were offset by a different amount). Seems like its a bug in Eagle. I manually applied offsets and like magic the Gerbers lined up perfectly. The Spark Fun support forums talk about this issue but more about trying to fix it mechanically (and nobody else concludes its an Eagle bug so my conclusion might be hasty). My approach was to place “corner marks” at the four corners of the board directly onto the silk screen layer so it was included in the resulting Gerber files. Then I previewed the files in Pentalogix ViewMate and tweaked by hand until I could see the marks lining up correctly. As soon as I get them back I’ll take some before and after assembly photos and post them. The Vancouver Canucks were eliminated from the playoffs tonight in their 5-3 loss to the San Jose Sharks. They played the Sharks last night too, we went to that game, it was our last game of the season. We had 1/2 season tickets this year – 20 games – sometimes we saw good hockey and sometimes so-so hockey and occasionally hockey that stinks. Let’s not talk about the Red Wings game back in March. There are many possible explanations for the problems this season. There were many injuries, especially to key players such as Dan Cloutier, Sami Salo, Matt Cooke and Ed Jovanovski. There were obviously – despite the claims to the contrary – problems between players. The Bertuzzi vs. Moore incident and its carry-over lawsuits, news coverage, etc. didn’t help at all. My opinion: the players stopped listening to the coaching staff and management. It didn’t help that the Canucks’ best general manager got booted at the end of the 2003-2004 season. Brian Burke was a great influence on the team; Dave Nonis seems to be a bit of a loser by comparision. Mark Crawford has been a great coach but he should have pushed to do more rebuilding of the team at the end of the last season. It was clear there were player issues even back then and its even more of an issue today. Let’s hope these things will be addressed in the off-season. First up: get rid of Bertuzzi. Pay someone to take him if that is what is required. He can be a great player but most nights he is not a great player; typically he is slow, gives up the puck if the wind blows hard, and takes way too many lazy penalties. I expect Naslund to retire but if he doesn’t then consider trading him too. Not because he is a bad player but because he doesn’t play like he wants to win anymore. Next, evaluate whether Dave Nonis is really the right General Manager for the club. Who knows, maybe he will work out, but now is the time to look around. Better look into getting more depth in goal too. I’d expect Cloutier to be back but Alex Auld probably won’t want to play second-fiddle to him. I’m sure there will be people calling for Mark Crawford’s head on a platter. We should keep him, he has done a great job and is still a great coach. Probably management will need to put pressure on him but otherwise they should keep him. It’s the players who aren’t delivering, not the coaching staff. Anyways, the Canucks are hosting the 2006 Entry Draft in June. Maybe they can pick up a few good players. You never know. Time to look forward to the 2007-2008 season.